Memorial day in the United States is virtually indistinguishable from July fourth. They are set a few months apart. Memorial day begins summer sales with barbeques and July fourth celebrates mid-summer with fireworks, barbeques, and mid-summer car sales. It wasn’t until I came to Israel that I discovered what it is like to be in a country that honors and mourns its fallen. It wasn’t until I came to Israel that I realized what it is like to be in a country that still remembers its founding after 2000 years of exile. Yizkor begins at sundown. As the last buses drive down the empty streets, the shops are closed. All shops. There are no sales, there are no banners, there are no barbeques. The city comes to a quiet. Families go home and light candles. The city makes its way to the city hall. I’m sure not the whole city is here but it feels like it. The stage is dark with hundreds of candle lights lit behind the speakers, poets, singers. They all wear black. As each speaker speaks the crowd is quiet. There are young and old, families and single people. They watch stories of soldiers who were killed in the line of duty trying to save the country from invaders. Pictures of young women and men, conscripted at 18 to defend their homeland appear on screens. Their stories are told by their families, happy pictures of children, families, girlfriends. Not an eye is dry. They are mostly Jewish eyes, the Arabs are upset that all is closed. It’s a complicated country. Then Hatikva plays, everyone sings as they all feel the pain together. Young women and men stare at tattoos that represent their fallen friends, kids think of uncles who passed away, mothers and fathers think of their kids and kids friends who would be alive, if not for the endless wars, whose true targets were all of us. We all know that in each person we mourn, there is a Jesus, someone who died for us, so we could live. The next day a siren sounds, the city stops. People look out on the frozen city from rooftops and drivers step out from their cars, thinking of the fallen in unison. They head to cemeteries and remember the young soldiers who died, the country remembers them, it’s the least we can do. Six pm, the grief turns to extasy. Decorations and flags cover the city in white and blue. Fireworks explode around the city and the same Rabin Square is transformed from a black and orange place of mourning to an explosion in laughter and celebration. 2000 years they waited and this is 70 years since Jews had the ability to feel free. 70 years since Jews could be poor without being called a Dirty Jew, be rich without being called a stingy Jew, be smart without being called a scheming Jew, 70 years of being just Jewish. Jewish with the ability to have a country, to stand up for each other, to celebrate our holidays, to pray as we wish without anyone’s approval. To have a country is to be free, no matter how many laws that country makes. It is the realization that a country is us coming together to say, this is us, this is our land and we band together to make sure no one tells us how to be. Bars are open and full all around the city. Kids walk around with inflated hammers hitting each other and little stars of David bouncing on their heads attached to a halo like the antennae of a bee. Israeli flags are draped on shoulders of girls and boys. The streets are closed. We walk the city like we own it, with beers in hand, unafraid and happy. We bounce from rooftop party to street party. Following our ears and eyes to places where people are happy, where people set up music blaring Israeli rock, Israeli rap, Israeli anything and American if they feel like it. We walk past punk bands and techno raves. We dance together, as Israelis until early morning. The morning comes with jets ripping the air along the beach with an air show. F-35 and F18 perform maneuvres for a packed beach where no foot is skinny enough to find a piece of sand. The city is there to see their ability to defend themselves, 70 years after running from plans, we now have planes to defend us from planes and rockets and any other hateful threat. The city comes noon is enveloped in the smell of chicken and lamb as mangal’s or barbeques are fired up around the balconies and Israelis, like their American counterparts, celebrate their freedom like cavemen did, by cooking delicious meat and drinking beer. 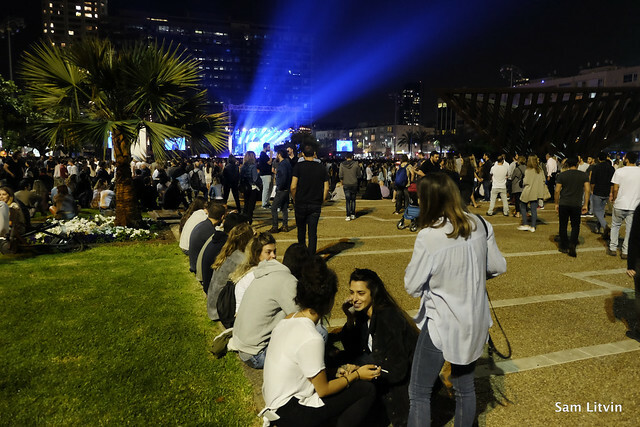 This is Israel at 70, this is what it’s like, to experience Independence day, in Israel. This entry was posted in Israel and tagged Independence Day, Israel, Tel Aviv, Yom Hatsmaut. Bookmark the permalink.